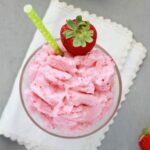 This strawberry smoothie recipe is a healthy option for the entire family! Made with fresh berries, yogurt, and almond milk for a healthy sweet treat. Ya’ll… My kid is the only one on the planet that does NOT like smoothies. We have tried so many varieties and he has shot every single one down. Until we got to this one. 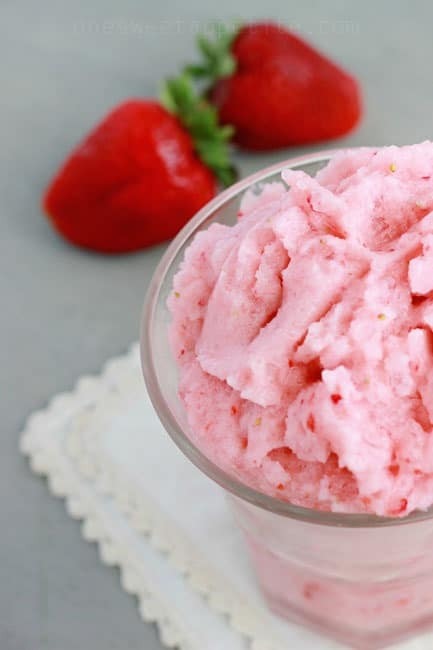 Fresh strawberries, ripened to sweet perfection, are paired with a handful of ingredients for the perfect ice cream substitute. This recipe has saved me during the summer. It is the perfect substitute for frozen sugar filled desserts. That’s right ladies and gents… My child will pick this smoothie over ice cream. We make it slightly thicker to give it the classic ice cream texture and he dives in with a spoon. I feel better giving in to his need for a sweet treat and he gives me brownie points. 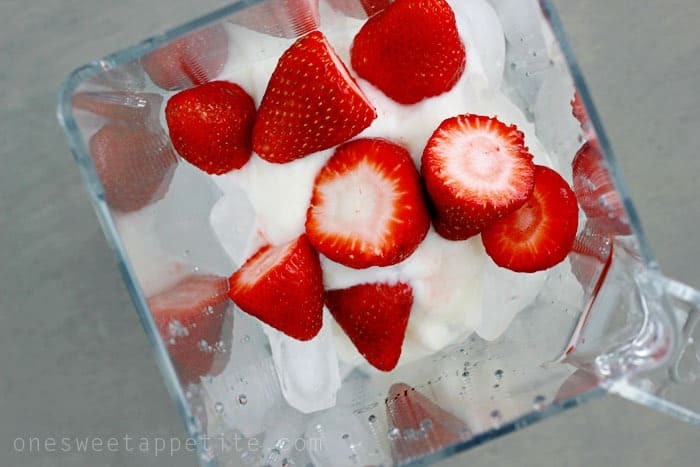 Combine ripe strawberries, plain yogurt, honey, almond milk, and ice in a blender. We try to use super ripe berries. They tend to be sweeter meaning I can use less honey or sweetener. You can even substitute the yogurt for sherbet if you want to really make this smoothie into a dessert. If you go that route, I suggest ditching the honey all together. Can you substitute other berries in a strawberry smoothie? Yes. Definitely. We have used peaches, blackberries, raspberries, and mixed berries. 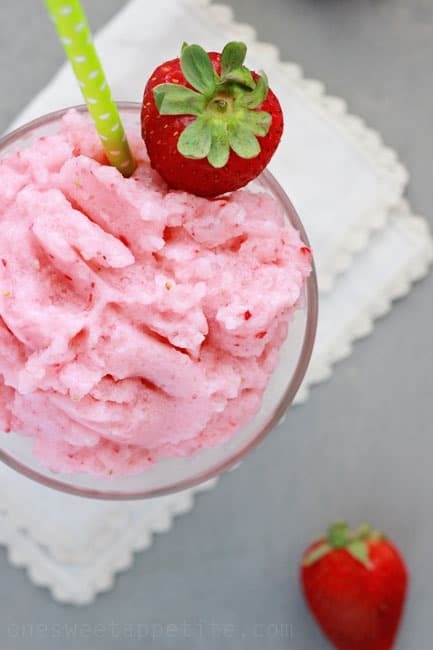 Swapping out strawberries in this recipe is super simple. Use equal amounts of the berry of your choosing. Be sure to adjust the sweetener based on the tartness of your fruit. How can you make a fruit smoothie more filling? This is a pretty common question I get. How can you make your smoothie more filling? If you are using this as a meal replacement it can be tricky. We find it best used as a snack or lunch. The yogurt adds protein to your drink but if you are looking for a way to get an extra boost I suggest chia seeds. We add a scoop right into the blender before we mix the ingredients. My son doesn’t even realize they are in there and it does not alter the flavor in the slightest. 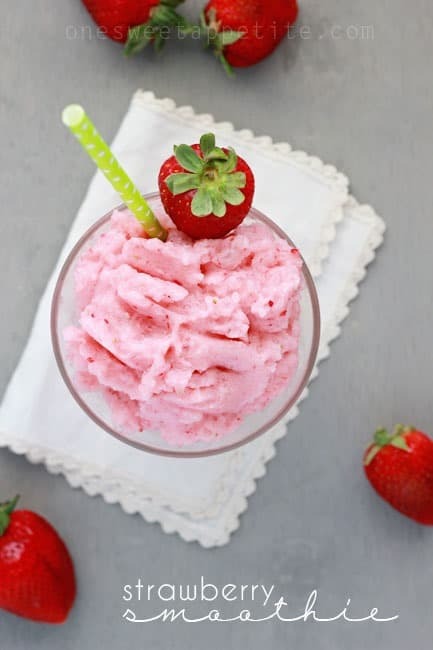 This simple strawberry smoothie recipe is a healthy option for the entire family! Kid approved and full of flavor. For a thinner smoothie double the amount of milk used. 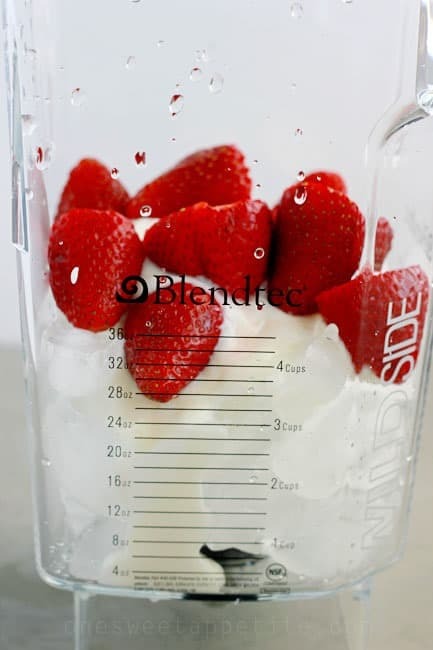 Isn’t the Blendtec just the best?! We love ours – one of the best purchases we’ve ever made! Use it once if not twice A DAY!!! I am starting to wonder how I ever lived without mine!